DECKER has been manufacturing since 1997 and supplying to Australia since 2011. Decker was established as a brand in 1997, not long after the first generation of wood plastic composite products had been developed and marketed commercially in the United States. Initially, first generation products were a combination of wood waste and binders and had limited strength and mechanical properties. However, technology moved forward in the 1990’s in conjunction with the extrusion manufacturing process. The current basis of wood plastic composites is referred to as the second generation; typically a combination of wood waste and polyethylene, these products have good mechanical properties, high dimensional stability and can be used to produce complex shapes. The decking market rapidly became the major use for such composites. Decker started selling composite decking in late 1990’s, mainly internationally from a UK base. However, in 2011, DECKER established its current business in Australia, marketting wood plastic composite decking from a central warehouse for delivery directly across the whole of the east coast. DECKER has also be sold internationally, and installed in commercial projects in Singapore, PNG and the Seychelles in the last ten years. 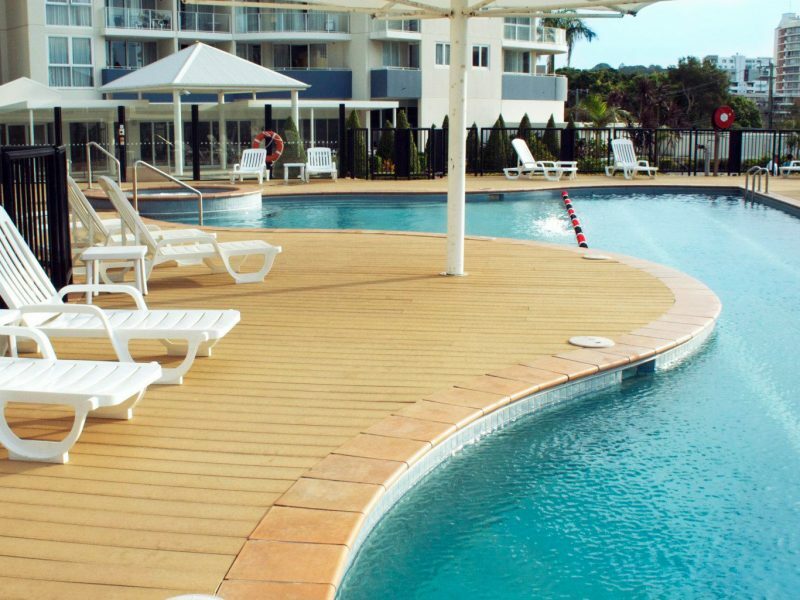 In Australia, DECKER’s composite decking has been used for a variety of commercial applications, in resorts around pools and in schools and childcare centres centre in play areas. In the last few years, DECKER has also been used as outdoor flooring on apartment balconies, laid over concrete. Having a long history means we have observed and participated in product development as the industry has taken an increasing share of decking and screening materials markets. Our product range now contains only solid composite products; hollow decking in particular has in some cases developed problems after a few years. In the last five years there has been further developments leading to a co-extrusion third generation of WPC. The product process produces a second generation core and then add a polymer based bonded coating as part of the co-extrusion process. These products are commonly referred to as “co-extruded” or “capped”. In 2018 we have introduced latest technology co-extruded composite decking, where the wood plastic composite core is capped or coated with a protective layer which stops the slight fading that occurs with uncoated wood plastic composites in the first six months. The coating also protects against stains. The new range of 3rd generation co-extruded or capped decking is called DECKER PROTECT – (READ MORE..). This decking is manufactured with a bonded coating for better looks longer. We believe service and advice is important. Buying decking materials is often a unique experience and there are few places where you can get expert advice about the types of decking available, the pros and cons of different composite decking offerings and design and installation advice. Our mantra is “ We are here to help” . We want to build our reputation and customer base in priority to just making the next sale. To demonstrate this we offer a How to Choose Composite Decking White Paper which is available for download; please fill in the form below so we can email you the White Paper.